“We were on the North Ridge - hadn't climbed it before and we got off route up at the summit pinnacle. Instead of directly climbing north ridge, we traversed around it (climbers left) onto the east face. I could see a gully on the east face that looked climbable so we headed for that. The gully looked to be 4th class with some nasty exposure, so my wife belayed from below, and off to the side. I went up about 20 feet and commented that there was no decent rock for placing pro. I finally settled on a large boulder (about the size of a person) that looked somewhat stable relative to everything else. I threw a sling around it and gave just a little tug on it and the whole thing just took off down the slope. It took a bad bounce and my wife couldn't get out of the way. She was struck on the shoulder and side of the head (helmet saved her life!). She fell off the ledge she was on and landed about 15 feet below on another ledge. 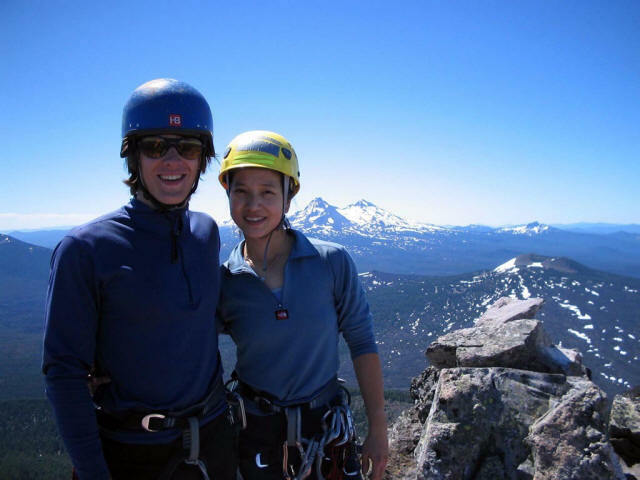 “I was leading, she was belaying from below - there was nothing special about our setup. I did give the boulder a wiggle before I slung it and it seemed OK - it wasn't until it was slung and gave it a slightly more firm pull that it gave loose. In retrospect, the best thing we could have done was turn back and try another route after noticing the poor quality of the rock on the east face. But, assuming we were determined to climb where we did - the second thing we should have done is found a better spot for her to belay from. She was off to the side from where we expected any rockfall but, obviously, not far enough. 9. Analysis of Accident: What knowledge and techniques will help prevent future accidents? The physical rescue was complicated by fog which prevented helicopter extraction on Saturday. The Camp Sherman Hasty Search and Rescue Team used a 300 foot rope to lower the injured woman from the exposed ridge, 900 feet down the talus slopes to a meadow on the west side from whence the helicopter rescue was effected when the sun cleared the fog on Sunday morning. Climb, climb, climb, we love to climb everyday. We climb whenever we can, weekday, weekend. If we can quit our jobs now and go climbing, we will do it for sure. But then I wonder, why do we climb? I recall several incidents where I would be crying on the rock, yelling at Matt for getting me into the position I hate to be in. What about our near death accident on Mt Washington? Are we doing this just for the sheer joy of being on the rock, clinging on it, fighting for our life? A lot of people that I know don’t understand why I do what I do. Maybe I don’t understand it myself. So here’s some ideas I’ve brainstormed. Why do I love climbing? I love rock-climbing because Matt and I get to do what we love together. I get to be competitive yet supportive with Matt. I think it’s tough for couples to share the same interest and I’m glad we both do the same thing. Sometimes I think if I didn’t like climbing, then I would just be sitting at home, worrying to death that something bad will happen to Matt when he’s out climbing. So once again, I’m glad I don’t have to be in that shoes. I do feel bad for those who love us though, like my mum. I bet she worries to death each time I tell her where I will be climbing next. Anyway, why else do I love climbing? I love the challenge of surpassing my climbing ability and work out the puzzle on finding the best way to go up. I don’t like mountain climbing but I often do it because I want to see how far my body can be pushed to get to the top. Climbing 7000ft, 12 miles, 14 hours, all in 1 day sounded like a crazy idea to me before I did Mt Baker. I kept telling Matt that we should just bail because I refused to be the last person in line, holding the whole group. But I surprised myself when I made it to the top and that I was not the weakest link. As the matter of fact, I felt like I was definitely one of the strongest in the group. Doing Mt Baker definitely opens up a bunch of opportunities for me now. Climbing Mt Adams in a day no longer sounds so hard. Climbing Rainier looks so doable now. Heck, maybe I should consider doing Denali someday. And to raise the bar even higher, we should go check out some of the high peak in Asia. Anyway, I rant too much. Why do I need a reason to climb? Just being outdoors is just so much fun. And the best part is when we get to the top and the views from above are always amazing. Mt Washington is a striking 7794 foot peak in Central Oregon. Its dagger pinnacle is amazing to look at and appears quite intimidating from afar. The most common route climbed is via the North Ridge, which starts on the Pacific Crest Trail. You follow the PCT for a few miles before turning left at a climber’s trail (usually well-marked with a cairn). This trail steepens and eventually gains the ridge. Continue on the ridge until you encounter a large gendarme. The best way around this is to skirt around the right side of it before making your way back to the ridge. Read further down the page for our epic that was started when we passed this gendarme on the left and got into some really ugly rock. After passing the gendarme and regaining the ridge, most climbers rope up for the final scramble to the summit (2-3 pitches if you climb the whole thing roped). There are several possible routes up the summit block. It is low-5th and 4th class climbing, but the rock is truly awful. I remember at one point discovering I was able to make hand holds in the rock with my finger nails. Not a real confidence booster. There is very little in the way of solid protection. In July 2005 I got it in my head that this peak would make a spectacular first rock climbing route for Joanne and I to attempt. Before this the only lead climbing of any sort that we had done was some real easy lines out at Horsethief Butte in the Columbia Gorge. But our confidence was high and we were pretty certain we could knock off Mt Washington, Three Fingered Jack, and Middle Sister in a 4-day climbing marathon. Of course, we would soon realize that the mountains are not always the best place to learn basic climbing skills. Mt Washington’s North Ridge: I’ll give you $10 if you can find a piece of solid rock anywhere here. Just loose rubble as far as the eye can see. Actually, I think the rock on Broken Top was even worse than this. “F***” was all I could utter as the loose block I had slung pulled loose and careened down the mountainside. The man-sized boulder took a bad bounce and headed straight for Joanne. She only had enough time to turn away from the run-away rock as it struck her in the shoulder and head and threw her off her belay stance. Our flimsy belay anchor probably would have held little more than body weight and failed instantly as she tumbled down. The rope, still running through her belay device pulled me with her. My fingernails, boots, and knees dug into the steep scree, desperately trying to stop my slide, as I was pulled towards the cliff edge 100′ below us. I remember thinking, quite clearly, “We’re dead…”. And then, just as quickly as the rockfall had begun, I came to a rest, quite alive. Somehow Joanne had managed to land on a ledge 10 feet below her initial belay position. If she had fallen any further she would have landed on a steep snow slope and would have certainly dragged us both right over the steep East Face of the mountain. I spent the next half hour constantly talking to her attempting to fully assess her condition. Although we were climbing on a beautiful July day, we were in the shade of the East Face and it was cold. I carefully slipped my backpack and rope underneath her body to insulate her. I took off all my clothes except for my long underwear and bundled them around her. It became very obvious that she was in no condition to walk out (let alone stand or crawl) and there was no possibility of self-rescue in this scenario. I scrambled down the ridge and was able to get a cell phone signal and dialed 911. My phone got disconnected several times but I was finally able to get my message through to the operator and they told me they had contacted the SAR folks who were already on their way. The SAR folks were able to reach our position in about 5 hours. Their response time was nothing short of amazing. It took a while to move Joanne from our precarious position on the East Face to the North Ridge where a helicopter might be able to make a pickup. Unfortunately, a thick cloud cover moved over the mountain just as the helicopter was approaching and they were unable to get close enough. The SAR team spent the night lowering Joanne down the scree slopes, the standard descent for the mountain. We finally stopped when we reached the bottom of the slope and had reached a large open area. We spent a cold night, huddled among the rocks, happy to have the company of the rescue team. Finally, around daybreak, the cloud cover began to break up and the helicopter was able to pick Joanne up. I watched her go up and away. Cause every little things gonna be alright"
Joanne ended up with a bad concussion with some internal bleeding in her brain. Her fingertip was broken and some bad bruising on her right thigh (we initially thought she had a leg fracture — fortunately there was no break!). She was walking slowly a couple of days after the accident. Just two and a half months after the accident we hiked the Timberline Trail and within 3 months of the accident she was leading her first sport climbs at Smith Rock! We were incredibly lucky to get away from this mis-adventure with our lives. Although it didn’t stop us from getting back into the mountains it certainly changed our perspective and attitude towards climbing. You can read all you want about a route in a guidebook or online but if you lack the ability to judge current route conditions or the judgment to turn around when necessary, then all the beta in the world won’t help you. The folks in Oregon’s Search and Rescue services: the first-responder team from Camp Sherman, the military pilots and medics, Linn County Sheriffs Office, and others (sorry I can’t remember all the other organizations that were involved) were able to save Joanne’s life. I am uncertain if she would have been able to make it through the night without help. Calling in a rescue should only be used in truly life-threatening situations, when self-rescue is not an option. For many months after the accident, I was unsure if I wanted to go back to the mountain. But Joanne said she wanted to go back and conquer her fears. And so, just a little over a year after the accident, on July 15 2006 we summited Mt Washington with the Mazamas, in a group lead by Josh Lockerby. © 2005 by Matt and Joanna. All Rights Reserved. Note: Please spend some time with Matt and Joanne, true Traditional Mountaineers. Their web blog covers far more than their progress as skilled trad climbers and mountaineers. The many photos show this charming couple on many summits and routes and provide a visual trip report for folks interested in North West mountaineering and outdoor living. I hope I have the opportunity to meet them one day soon. Climb on! I checked on your progress as Traditional Mountaineers again this evening. Congratulations! Email or call if you like. and mitigated by information, training, interesting gear and knowledge gained through the experiences of others. It’s been almost 3 years since the accident occurred. I guess I never did comment this blog personally so here are a few of my memories. Even though I am in great perfectly healthy now and the whole accident feels like it never happened, each time I looked back to the night I spent on the mountain, it’s pretty scary. I was tied down in a wooden carrier because the rescuers worried that I might have spine injuries. Now and then they would come and give me some shots for my nausea due to the head injury. I was so glad the moment the helicopter lifted me up in the air and boy was I happy when the nurse placed a hot blanket on me. I will always remember the pain I have to endure the next 3 weeks because it was the worst pain I have ever experience. I had hematoma on my head and because of that my head constantly throbbing in pain. I was given morphine every 4 hrs for the 6 days I was in the hospital. Then I lived on Vicodin for the next two weeks. I was so relieve the day I woke up and no longer needed Vicodin. Surviving the epic is great and I learn that I don’t ever want to be in this situation again. If I ever in any doubt of my safety, I will never hesitate to back out and live another day to try again.